Finally had a chance to update the battle, it has become extremely bloody and is clearly mirroring history. We are now up to 30 turns, the great thing about the Lasalle rules is that the mechanics are quick and exciting to apply, the game just zooms along. Rafa asked me to explain the Zone of Control (ZOC) rule, I had grafted on to this scenario. The model of Hougoumont being used is just too big to apply the Lasalle BUA rules. My BW is 40mm and each BUA under Lasalle should be no more then 12x12cm. 1 BUA represents the space that 1 battalion would occupy. If you think about it historically, no more then 3 battalions ever occupied the building complex and the walled garden at anyone time, so really the the maximum number of BUA's I could use in this scenario is 3. The complex made of 3 BUA's would be 36 cm x 12 cm. My model is approximately 70 x 60 cm, so there is no way I could use the Lasalle BUA rules with this model. A model of 36x12cm would be just visually unappealing and for me would ruin the whole game experience. I searched through other rulesets, and really the only set that deals with this problem in a reasonable fashion is the Republic to Empire ruleset. Barry Hilton recognises that the visual appeal of the war game is of first importance, but at the same time appreciates that most models built have a footprint way out of proportion to the game scale. He has developed an approach that disregards the size of the model, but looks at it as what it historically represents. All BUA are classified as to their size and to their construction. 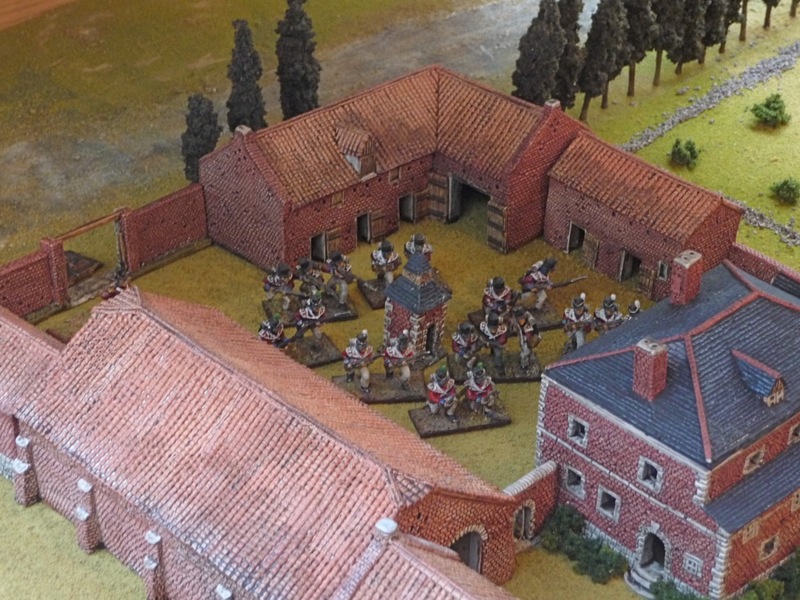 The rules would regard Hougoumont as a size 3, construction style C complex. The size of the complex determines both the number of troops that can garrison it and attack it at one time. Some simple calculations indicated that no more then 3 battalions can garrison Hougoumont and 6 battalions can attack (or be in the ZOC at one time). Another simple calculation gave me a ZOC of 6 BW. 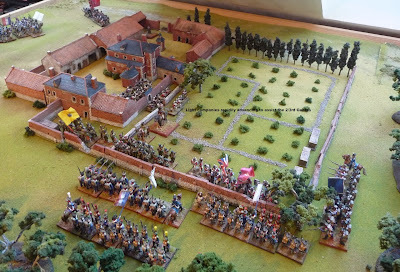 I then thought about this, the actual Hougoumont complex and walled garden is around 240 by 120 metres in size. If you think about it, a French attack column is probably 150 metres wide (200 men), so having 6 battalions attacking a complex with a total linear perimeter of 720 metres is reasonable. I hope this explained things. I also had to make a couple of other minor tweaks as the game went along. Once a breach was formed in the wall, I had to think about what formation a battalion had to be in to charge, well according to Lasalle a battalion in column of march can not charge and it seemed unreasonable that a battalion in line could move through a breech, so I settled on only attack columns being allowed to charge through a breach. Also I had to think about the bonus in combat for being at a higher elevation, I decided to give it to the allied forces within Hougoumont as I believe the walls were at least 7 feet in height and the defenders were on elevated platforms shooting down. Probably wrong on this one, but we will see how it goes. Anyway on to the battle: Both Jamin and Soye need to redress their brigades, it now seems that Jamin is going to advance north to the east of the compound while Soye is advancing north to the west. Certainly it appears that the allies are going to be encircled (the weakness of the OB for this scenario is now becoming apparent, should have had some cannon on the ridge as was the case historically to threaten the French advance to the east of the complex). The 3/1e legere maneuver into attack column to charge the Nassau. The guards light companies advance through the complex. The 3/1e legere charge and the engineering detachment of the 2/1e legere makes contact with the wall. The Nassau easily repulse the 3/1e legere and they fall back. Amazingly enough McDonnell throws a double 6 and the Nassau recover a DISR. The 2/1e legere engineer throw a 3 and his fuse fails to ignite. The flanking fire from the 4/2e legere into the 2/3rd Guards starts to cause damage despite the hard cover. 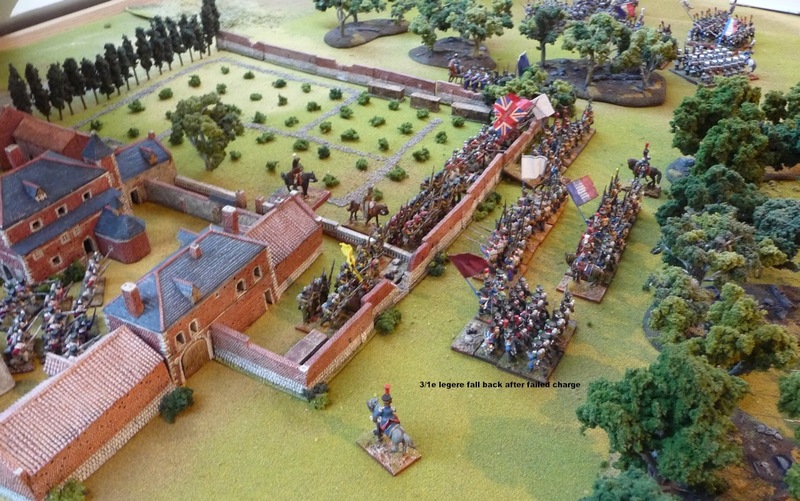 The Coldstream Guards wheel to meet the lead battalions of Soye's brigade. 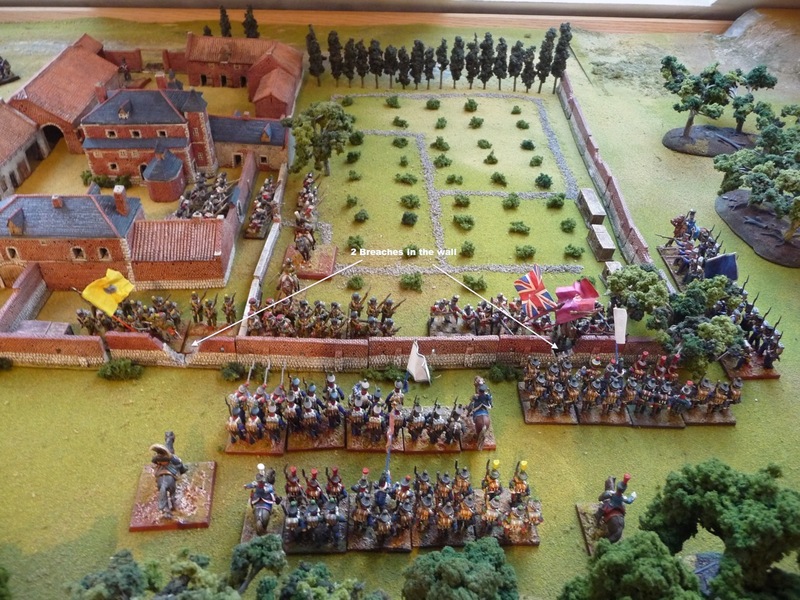 The light Guard companies enter the walled garden, the 2/3rd Guards are being pounded with flanking fire. The engineer from the 2/1e legere replaces his fuse, ignites it and blows a hole in the wall, there is now a second breach. The Nassau and the 2/3rd Guards continue their fire Baudin's brigade is weakening. The 3/1e legere are destroyed. The 2/3rd Guards wheel backward to allow the light companies to replace them at the wall, but they lose their hard cover by doing so. Not looking good!!!! Well at the end of 30 turns, it is starting to look a little tricky for the Allies. 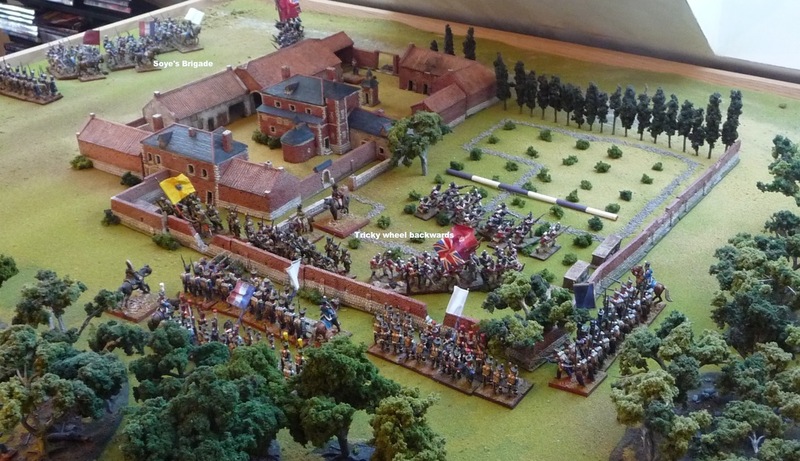 The French outnumber them by 3 to 1, but have only lost 2 battalions so far. If the 2/3rd Guards fall, the Allies will have to start taking Morale tests. A very exciting game! Your ZOC concept seems veryr easonable here. Are you using the Scruffs proposal (Lasalle Forum) for assaulting defiles with march column formations? "A march column can assault a defile like a bridge. It fights at 1/2 dice and with no previous shooting, adding a -2 for "bad terrain" as they will be fighting in cramped quarters. However the small front, the enemy never halves their dice"
I did not use Scruff's rule. I looked at the breach in the wall as not a single narrow gap, but a series of them. I felt that I would stick to the rules, aside from not allowing a battalion in line to advance through the breach. I am looking at this run through as a trial, and I already have planned some changes to the scenario. This is a great report and a great looking game! I like what you've done in amalgamating both Lasalle and R2E to get the feel that you wanted. As a suggestion for a future replay you might want to try the mechanism R2E has for 'feeding in' reserves. To me it seems more plausible that a battalion would not actually engage a built up area in formation but would break itself down into assault groups probably in company strength or smaller. This way the senior officers would be able to commit reserves as the battle unfolded. Just a thought. The Lasalle rules worked much better then I thought they would. This was a trial scenario, just to see how it would go with Lasalle and I am quite pleased. I agree that I need a method to better feed the reserves and I am also going to consider putting a restriction on how many battalions can attack each of the 4 sides of the complex (ie being in the ZOC on each side at each time). 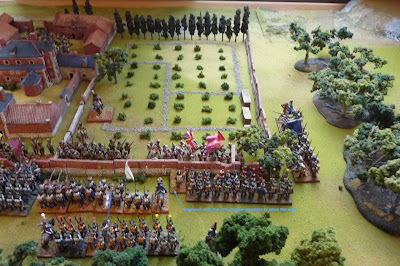 The other difficulty I had with Lasalle are the limitations in the utilization of troops graded as irregular (in skirmish order). The mechanisms of firing, combat and movement really worked well though and all though it ended up being 40 turns, the game zoomed along with very little reference to the book or even to the QRS sheet. I enjoyed your conversation with Barry Hilton on the LOA forum, I believe he has a great set of ideas in the RtE rules, but they really need to be re-written. I also believe some of the mechanisms are a little over-wrought for me anyway. I was happy that I could combine the rulesets and I will look again at the feeding in the reserves section. 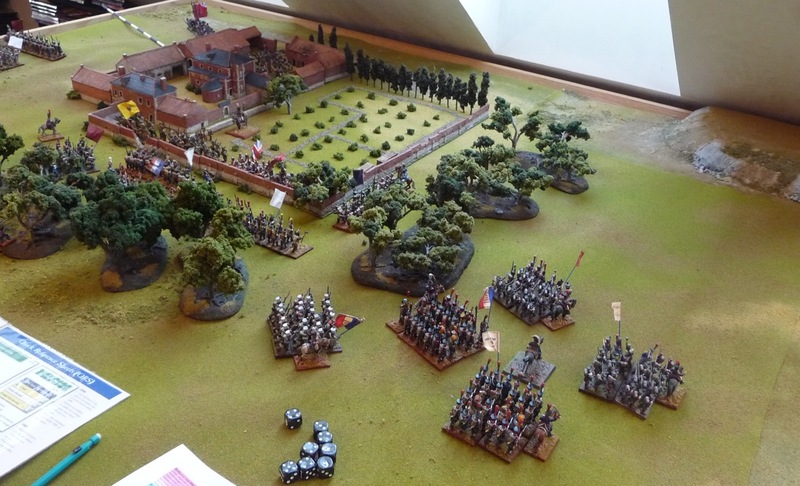 I plan to do a battle report of a Lasalle game in the near future and so your positive experience with the rules give me some optimism. I hope to introduce some suggested modifications/changes to both 'Black Powder' and R2E on my blog soon - I look forward to your thoughts. I will be quite interested in what you think of Lasalle. Sam Mustafa's attitude is quite different then Barry Hilton's on their respective forums in respect to questioning aspects of their rulesets. Lasalle is by far the best written rulebook I have seen (I have them all except for GdB). Unfortunately, I find that LOA group have a take it or leave it attitude, and are generally quite defensive. Yes, I have to agree with you, the LOA forum can seem a bit 'cagey' at times. I sometimes find it can give the impression of an 'Old Boys Club'. I may be totally off here but that is an impression I get.